In any commercial build, the safety of your users has to be a number one concern. If you’re designing or building an environment where the floor is likely to get wet, even if just from condensation, then anti slip tiles are a must. Understanding the complexities of anti-slip surfaces will help you to choose the right commercial tiles for your project. What makes a tile anti-slip? There are a number of things that make a tile anti-slip. Natural texture – The tile might just be naturally anti-slip; tiles like riven tiles are naturally rough. This rough texture provides suitable places for the water to fall and so the contact between foot and water is minimised and grip is maximised, so the likelihood of someone slipping is reduced. Black state tiles are a good example of natural anti slip properties. Acid etched – Other tiles can be etched with acid to provide a similar effect. These acid etched tiles have a rougher surface too so that they provide grip even in the wettest conditions. Anti slip coating – Commercial tile manufacturers have come up with anti-slip coatings that allow you to coat a floor that is already installed and give it a far better anti-slip grading. This means that you can coat pretty much any surface including; concrete, porcelain and stone and make it anti-slip. This can keep the costs down for your clients if they aren’t in the market for a new floor or new walls and keep their customers safe. For example, if you have a preference for particular concrete floor tiles, it can easily be treated to give it the anti slip properties you require. When Should Anti-slip Tiles Be Used? Anti-slip tiles should be used wherever there is a possibility of water getting on the floors or walls of an area. This means in places like commercial kitchens, bathrooms, in and around swimming pools and outside areas, they are crucial. This isn’t to say that each of these areas need the same tiles, some areas need higher grade tiles than others. Commercial anti-slip tiles have a variety of different ratings, which we will get into in a little bit, but understanding this rating system means that you can install the right tiles in the right places. This means that your clients, their staff and members of the public can walk safely, with minimal risk of slipping. Commercial Kitchens – These tiles need to be a high enough grade to make sure that if any liquids are split, the people working in the kitchen aren’t going to slip and fall. Shop floors – Risk of slipping in shops is probably less than in other environments, but it still could occur. In this instance the legal implications of someone having an accident warrants further investigation of tiles with anti-slip properties. 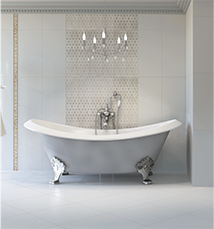 Bathrooms – The bathroom floor will definitely require anti slip tiles as it will frequently get wet. But what about the walls? The walls should have good anti-slip properties, especially in commercial use, without this, the person using the bathroom may slip and fall if they steady themselves on a wall that has condensation on it. When installing exterior floor tiles in locations where they are likely to get wet it is also important to consider the non slip properties. Non-slip tiles for wet rooms need to be of the highest grading possible to ensure the safety of the users of the wet room. This means that whether you are installing wet rooms in a hospital or a block of flats, you must make sure that you use tiles of the correct rating for the job. Because of this, it was quite restricting when it came to the look of the flooring and walls in a wet room for many years, which meant that some people weren’t able to get the look that they were after and stay safe. Thankfully, you can now offer your clients the look they want and get a safe user experience, which is possibly more important in this situation. There are plenty of anti-slip wall and floor tiles to choose from that work perfectly in wet rooms nowadays, it really just depends on the budget that you have to work with. The days of a wet room looking like a public convenience are certainly over, as long as your client is willing to pay a bit more for style and safety. Most wet rooms do still use porcelain anti-slip tiles, but there are many different colours to choose from so you can make a wet room look and feel anyway your customer wants it to. With so many outside communal areas popping up around the country now, it shouldn’t be a surprise that non-slip tiles for outside steps are in high demand. One of the issues of outside tiling, of course, is that it has to stand up to the elements. With rain, snow and blistering summers all in these tiles future, finding the right ones to use can be quite an issue. Quarry tiles – Made from natural clay that makes them very hard wearing, perfect for high traffic areas like steps around train stations and parks. Slate tiles– Typically grey but can be found in orange and purple too. Slate gives a very polished look to any area but works particularly well in areas like communal gardens or pub gardens. Stone tiles – Provides a rustic look that looks excellent outside hotels and around swimming pools if done right. Some of the flooring tiles above do require a coating, especially if they are going to be used on outside steps, as they will soak up the water naturally if they aren’t properly sealed. Thankfully, there are non-slip tile coatings available if you want to use porous tiles in outside areas and make sure it is safe for the people using the steps. Anti-slip tile coatings for commercial grade tiles are a chemical treatment that increases the friction coefficient of the tiles, thus creating a far safer floor or wall even when wet. The chemical coating is clear and can be used on pretty much any tile including natural stone tiles, porcelain tiles and even cement floors. The clear coat provides safety but doesn’t take anything away from the look of the floor tiles. Anti-slip tile coatings are very effective with a range of footwear and even work when the walker has bare feet, which makes it great in applications like hospitals and around swimming pools. One of the best applications of anti-slip tile coatings is applying it to designer tiles. The coating allows you to get a beautiful look without compromising on safety. To find out more about non-slip tile coatings, please click here. Commercial non-slip floor tiles are given a rating that helps to grade the non-slip level of a particular tile. This rating is known as the “R” value of a tile. There are a number of different R values, R9 and R10, for example, are what is usually recommended for use in domestic kitchens or bathrooms where the risk of slipping is present, but not common. The R13 value is given to anti-slip tiles that are recommended for commercial and professional use. These tiles are perfect for use in wet rooms and showers in public changing rooms, for example. Ceramic tiles have their slip resistance tested using the draft informative index classification (ISO 10545). This classification will be obtained by testing the ceramic tiles in both dry and wet conditions prior to installation. Group C – R13, R12 and some R11 with a class of 0.44 to 0.92. For use in public areas such as communal showers, swimming pool surrounds and larger areas like shopping centres. Group B – Some R10 and some R11 with a class of 0.27 to 0.33. For use in mainly dry situations or where slipping is uncommon. These ratings take into account the measurements of the coefficient of friction of the slip resistance found in testing. It’s vital that you’re aware of these tests and what different types of tiles are rated for to avoid any risks of injury after installing commercial non-slip floor tiles. For more information on the rating and grades of commercial anti-slip tiles, please click here. One of the most used tests in anti slip tile testing is the pendulum test. This test is designed to replicate a person walking and the heel to toe motion we walk with. When we walk on a wet floor, a thin layer of fluid is created between our shoe and the floor; this is what causes us to slip. The pendulum test uses an arm with a rubber foot that swings down onto a freshly wet tile to test how slippery it is under these conditions. After the test has been repeated a few times, that tile gets a Slip Resistance Value (SPV) or Pendulum Test Value (PTV). The better the slip resistance that is offered by a tile, the higher the rating. This test works great because it replicates the way we walk so well that it actually forms the same layer of liquid between the rubber foot and the tile. The pendulum test also works under dry conditions and is used to test the anti-slip properties of tiles and other flooring materials that are to be used solely under dry conditions. There are a lot more tests for commercial and non-commercial anti-slip tiles, but the pendulum test is the only one recognised in the UK. If you would like to find out more about anti-slip tile tests, please click here for more information. For help sourcing the perfect anti slip tile for your commercial project, don’t hesitate to get in touch with our sourcing team. We keep abreast of the latest developments and trends, ensuring that we’ll be able to find an anti slip tile that meets your precise requirements, both from a cost and design perspective.